Calculate, comment, correct - quite simple with CalcTape for Android ! CalcTape masters the four basic arithmetical operations and percentage calculations. 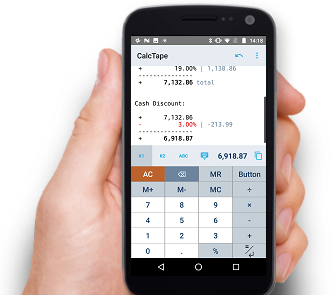 CalcTape for Android requires Android 4.4 or higher. Create and save calculations in documents. Create your own buttons and functions. Many additional functions like TAX buttons. Send calculations to business partners via e-mail. Use additional functions to share your calculation documents. Open calculations from e-mail attachments and file managers.